In 1988, Nintendo hinted at the return of Donkey Kong in his own new adventure in the pages of the Nintendo Fun Club newsletter. This return was also commented on in the very back of the Nintendo Players Guide, in the "Coming Soon" section. Sadly, this was not meant to be, and in place of a new game, Nintendo released a compilation cart (maybe the first compilation cart in video game history?) of the first two Donkey Kong games. 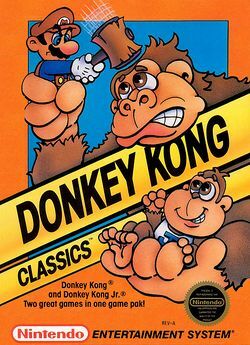 Donkey Kong would not return in ernest until 1994 on the Game Boy as one of the very first titles supported by the Super Game Boy adaptor for the Super Nintendo. This page was last edited on 18 August 2008, at 23:51.